It is easy to slip into the belief that summertime is the time of year when you don’t have to worry about your roof. But the extremes of weather during the summer can be harder on your roof than other seasons. 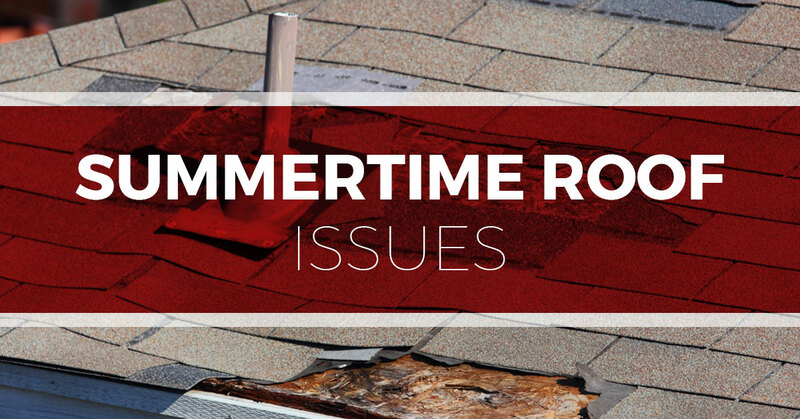 In this week’s article, we’ll go over some reasons that summertime is when you need to keep an eye of your roof. If you think you have any developing roofing problems, call Tim Leeper Roofing. We serve the Nashville area from our base in Old Hickory. We offer both residential and commercial roofing services. Because you are outdoors more in the summer, you are more likely to see damage to the roof. You could look up from your riding mower and see a hollow on the roof or exposed decking. Or you could be retrieving a frisbee and notice that your foot has stepped on a spot that gives way under your weight. On that note, we should say that it is best to stay off of your roof as much as possible. You can easily knock off the important, protective granules that coat the asphalt shingles on your roof. The decking of your roof is the essential layer of plywood that is underneath the shingles. It is what allows you to walk on the roof safely and acts as the ceiling in your attic. Summertime is when damage to the decking is visible and can get worse. If you are missing any shingles, water can creep in and damage the plywood. Other than seeing hollows and physically stepping on your roof, there are a few things to look for that can be an indication of roofing damage. One thing is unusual algae growth. Algae or mildew is fairly common in this area, especially in areas of the roof that have lots of shade, but if your roof is not particularly shaded or is clear of algae except in one area, it could be a warning sign. If you have an undetected leak, it can allow moisture to reach the decking. The wood of the decking can hold water and subsequently allow algae or mildew to grow on the shingles above it. The intense and unrelenting heat that summer brings can damage roofs. If you have any asphalt shingles that are missing a large portion of their granules, the underlying material can be damaged by exposure to hours of UV rays from the sun. If you have shingles that are beginning to curve or have cracks in them, they could be letting water into the deeper layers of your roof. When water reaches the decking of your roof, there are many other problems that follow that can mean major repairs are needed. Everyone who lives in Nashville takes a certain amount of humidity for granted. The summer months with their sometimes oppressive humidity are just part of the territory of living in this gorgeous area. If your roof has any tiny leaks, the moisture in the air can creep in and cause damage to exposed wood. Additionally, condensation of the roof surface can also seep in and cause damage. This is one reason Tim Leeper Roofing always uses the best ice and water shield underlayment when repairing or replacing a roof. No matter how new your roof is, if it isn’t properly ventilated, it can bake itself to death. The hot and humid air that is prevalent in the daytime and become trapped in the attic, and as temperatures drop in the nighttime, the water will cause condensation when the temperature reaches the dew point. Then this happens inside the attic as a result of poor ventilation, damage to wood, as well as mold and mildew, can occur. Any possessions stored in the attic will also be damaged by this condensation and mold. It can also cause outrageous cooling bills in the summer and heating bills in the winter. The air in the attic should be as close to the temperature of the air outdoors for several reasons. One winter benefit you’ll get is that warm air from inside won’t melt some of the snow or ice on the roof, which can lead to damaging ice dams. If your attic is warm and moist, it raises the chances of you also having pest problems. Insects and rodents tend to colonize areas with a constant source of water. If your attic is damp and has nightly condensation from a lack of ventilation, or has an opening as a result of rotten wood, you could quickly find yourself the host to a large population of pests. If you think your roof is in need of a summertime inspection, call Tim Leeper Roofing. We offer both commercial and residential roofing services and always offer Speedy Fast Quotes. Call us today!